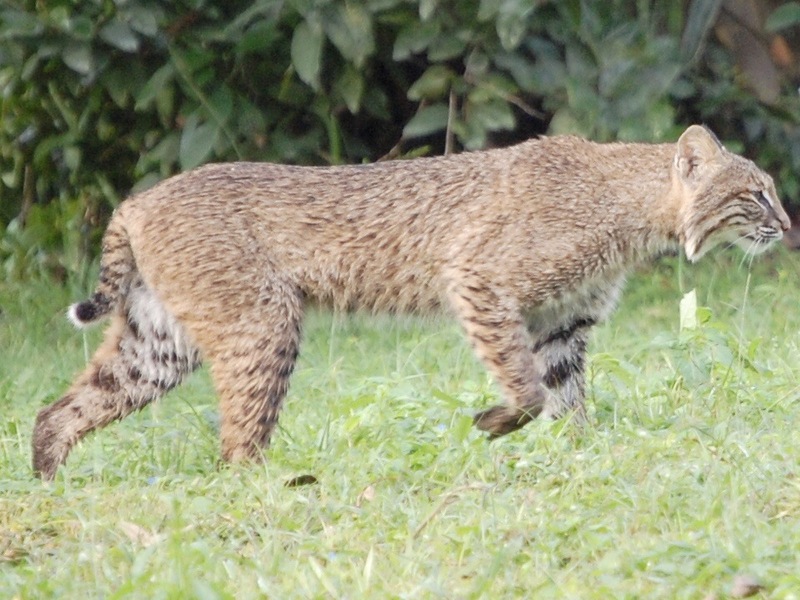 Bobcat, Sewall’s Point, 2008. Photo courtesy of Jackie Pearson. I have had many phones since 2008. 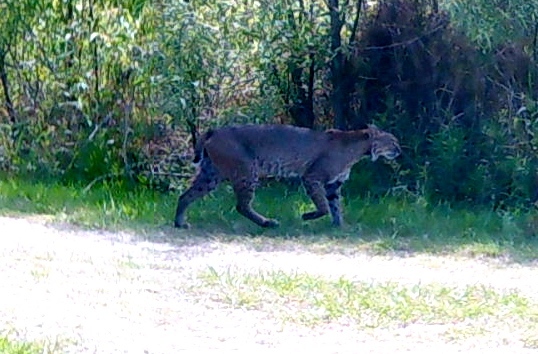 I have dropped them, lost them, and forgotten them…Throughout all of my phones, only one image has graced its screen: the “Bobcat of Sewall’s Point,” by Jackie Pearson. In the hectic bustle of my days, I often look to this image as a reminder of what’s important to me. 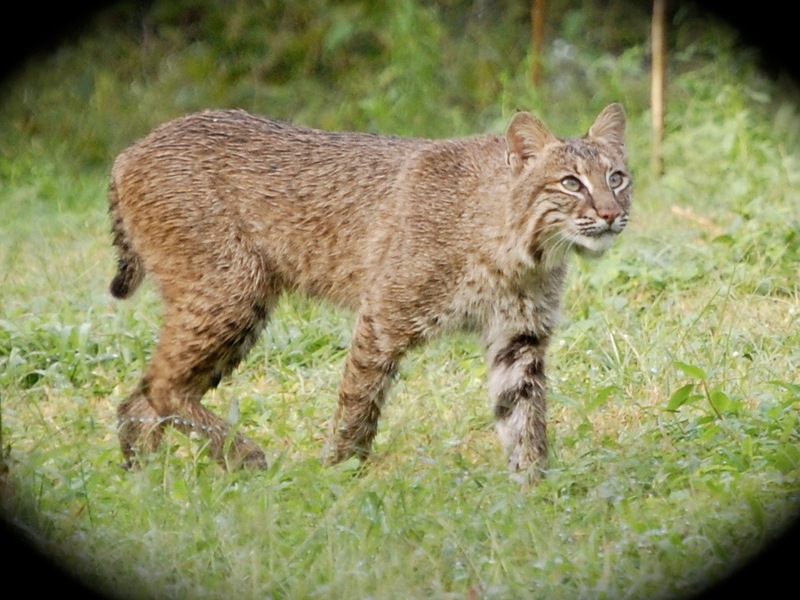 Today I will share a few other bobcat images I have compiled over the years. If you are lucky enough to see one of these secretive and shy survivors that has adapted to our human world of the St Lucie River/Indian River Lagoon, don’t be afraid, be amazed! Sewall’s Point bobcat 2008, Jackie Pearson. 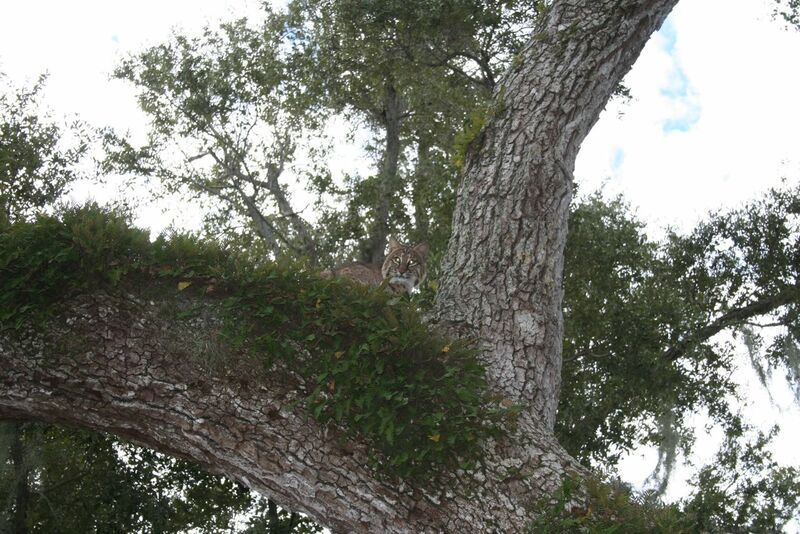 Bobcat up in oak tree, Sewall’s Point, 2010, Beverly Beavis Jones. 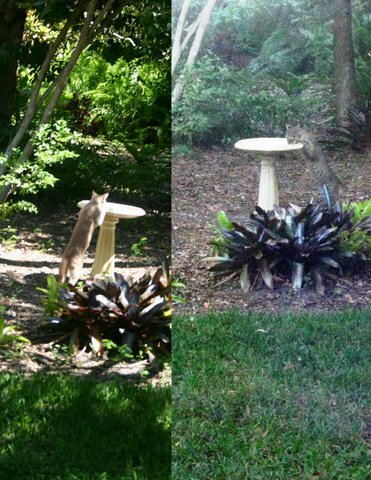 Domestic cat juxtaposed to wild bob cat–drinking from my mother’s bird bath, Sewall’s Point. Sandy Thurlow, 2012. 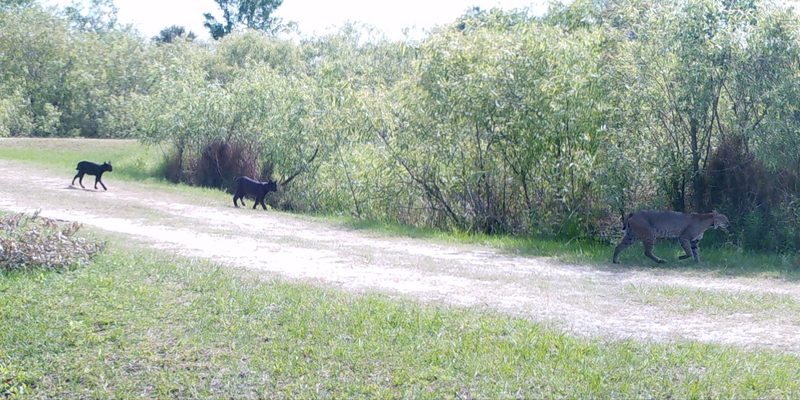 Coyotes are here along the St Lucie River/Indian River Lagoon. Coyotes were historically associated with the American West, but now they are now in most states and have been reported in 66 of 67 Florida counties, other than Monroe. There is no one to thank for this but humans. With the near eradication of the the American wolf and family of big cats related to the mountain lion since the 1800s, coyotes have no natural predators, other than man, and thus the coyote has flourished. Most recently, along the Treasure Coast you many have read about Indian River County using cameras to see if coyotes are raiding sea turtle nests, or the controversial trapping and killing of the coyotes at Witham Field in Stuart interfering with plane landings, or the many residents in Palm City or western St Lucie County, who say they hear coyotes howling at night. Coyotes have also, within the past six months, been reported in the Town of Sewall’s Point, in the vicinity of South River Road on the south end, and Castle Hill in the north. 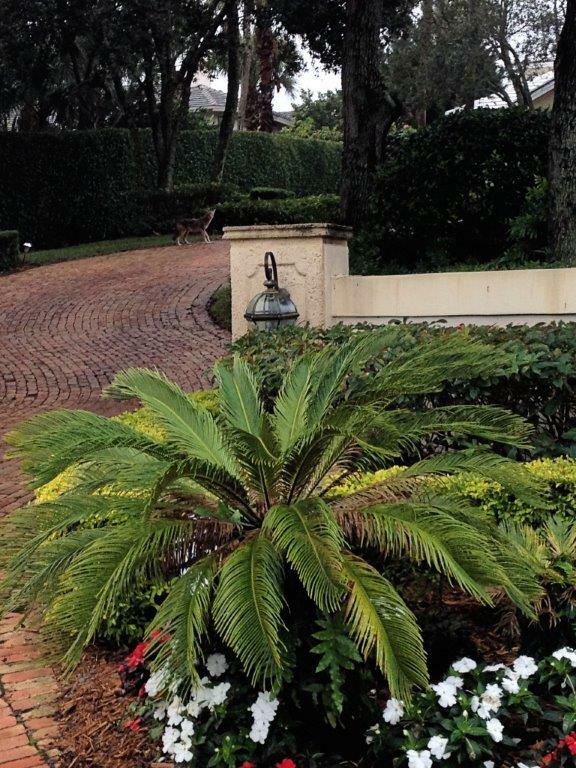 As a long time resident of Sewall’s Point, I love the wildlife and encourage all to live in harmony with these animals. They are God’s creatures and they keep the rat population down! 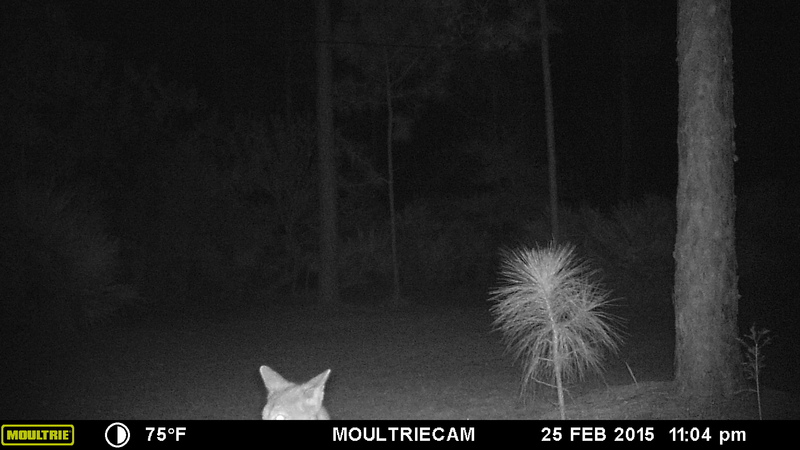 I have seen both grey and red foxes, as well as many bobcats. 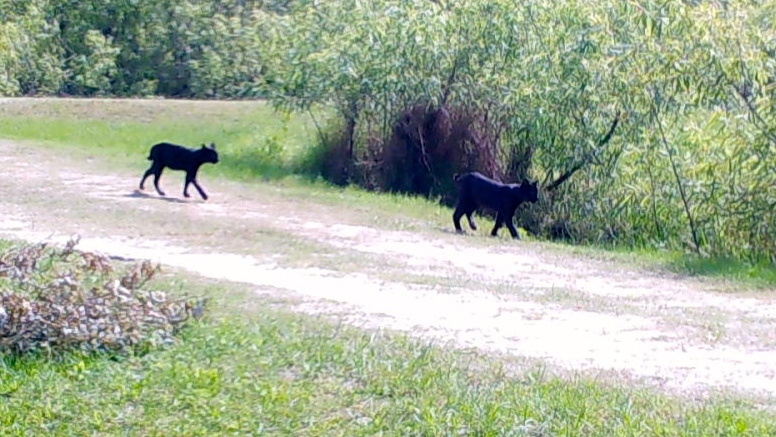 I have friends who swear in Sewall’s Point’s earlier days, they witnessed panthers. But I have yet to see a coyote. Unlike native bobcats who are solitary animals, unless mating or raising young, coyotes usually hunt in pairs and belong to a pack of about six members. Coyotes are in the dog family and are related to wolves, foxes and domestic dogs. 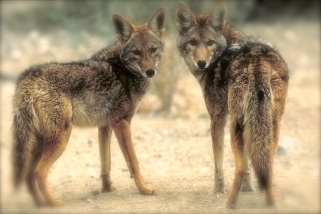 Coyotes and dogs can mate although this is unusual as coyotes have specific social ties and mate only once a year. When dogs and coyotes do mate, the hybrid offspring is called a “coydog.” Coydogs are well documented out west and are said to make poor pets, as more often than not, they are very high strung. 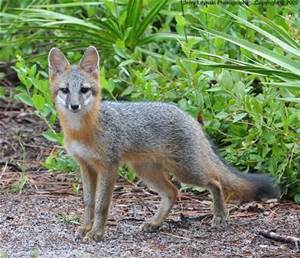 The photo below is a grey fox for comparison. Coyotes are taller and weigh more than foxes; in our area sometimes weighing up to 30 pounds, whereas a fox may be closer to 12. Should we be scared? I don’t think so. We just need to be smart, coy and cautious, like the coyote. Many Native American myths laud the craftiness of “coyote” and often in Native American mythology, he is so respected, he is portrayed as the “Creator.” He is respected for being “ubiquitous,” as he is so successful, “he appears to be everywhere at once,” or “seems to appear everywhere at the same time.” He is not to be outsmarted. 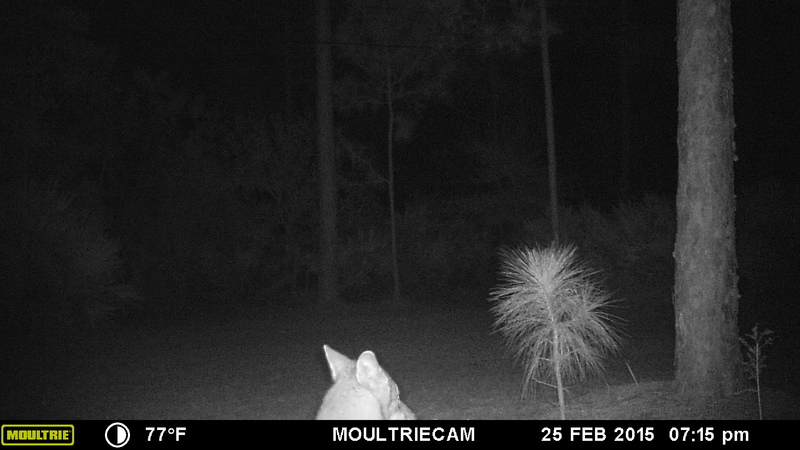 One thing for certain, now that coyote is here, chances are, he will not go away. We must learn to live with him by keeping our distance, not leaving pets out for long periods unattended, in the evening or early mornings, and by not feeding him. He is smart enough to feed himself. It is said we all have a bit of fear in our inner most nature, as the collective memory recalls the earlier times of fires and wolves, but then humankind tamed the wolf and hence today, we have “man best friend,” our dogs. Remember that the coyote is related to dogs if you see him, and if you look him in the eye ask for a sliver of his adaptability and success surviving on an ever changing planet and an ever changing Indian River Lagoon. I added this photo from Dr Gary Goforth 8-13-15 that was taken this February in Foxwood off 96 A in Martin County.